The mitts shown have 5rnds of K1P1 rib at the top of the palm. It works for the ones I made my father, but others might find it a bit skimpy so I’ve included alternate instructions to do 10rnds of K1P1 rib so the finished palm sits higher on the fingers. Firstly, I wove in all the ends of my dad’s Joe Schmoe Fingerless Mitts, so I’ll be able to get pics of them today and post the pattern later this week. 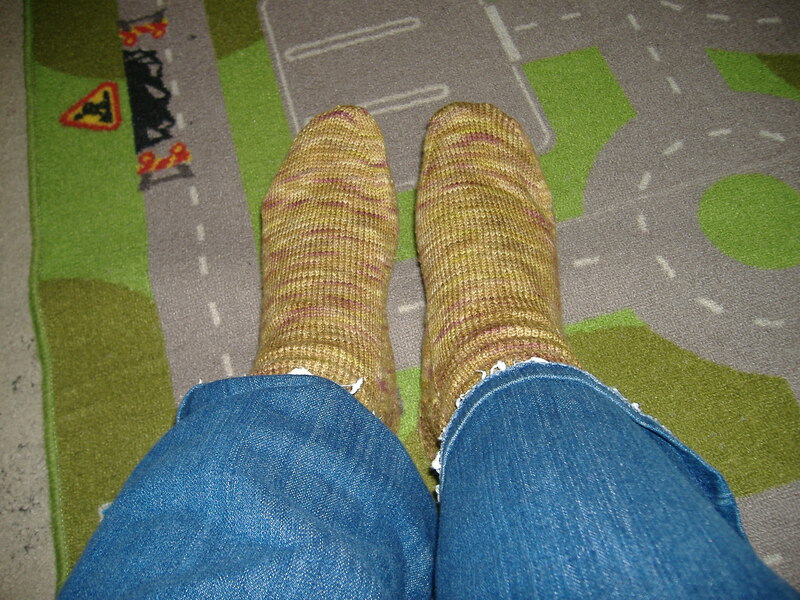 Secondly, I’ve been having a doozey with some socks I’ve been trying to knit. This once represented a skein of the old Colinette Jitterbug (tells you how long I’ve had it). There was a weak spot in the yarn while I was doing the cuff and I prayed it didn’t mean what I thought it meant. I moved on and by the time I got to the fourth repeat of the No Purl Monkey socks, my fears were realized when I had two more weak spots within a couple of rounds — moths had gotten to my yarn. Granted, this was old yarn — I have no idea how long ago I even bought it and it was back when Jitterbug came in about 320m skeins, not the handy 400m skeins it comes in today. I’m lucky. I got two 30g balls, a 21g ball, a 17g ball and some odds and ends — more than enough to do a simple pair of fingerless mitts out of for myself (probably just the female version of the Joe Schmoe Fingerless Mitts pattern). This one hurts a little bit more. I’m just finishing the fifth repeat of the No Purl Monkey socks in the new Colinette Jitterbug 400m yarn in lilac and I have made the decision that they are indeed too small for my feet. I can get the cuff on, but just. I’m going to have to frog it and start over again with 72sts to the 64sts I have here. I did this for my mom’s socks, so I’m familiar with the change up. It adds a stitch on each side of the first row of the chart (you have 4sts before and after the decreases as opposed to three) and it add two rounds to the chart, so not a huge change. This should fit my foot so much better. It’s hard to frog it, but at least it’s an easy pattern and works up quickly — I did the above yesterday afternoon and last night. I’m bringing it with me to my mom’s this afternoon so I should be able to get some work done on it there. I made my first call to Knitpicks customer service today for my bent and cracked needle. You can definitely see the bend in the needle, but I couldn’t get a shot of the hairline crack. The customer service representative I spoke to sounded a little dubious that the needle had bent and cracked in regular use but they are going to send me a replacement needle. I’m hoping I can loosen my grip a bit so this doesn’t happen again but my Addi needles all have similar bends in them so I’m not too hopeful. I love the pointy tips on the Knitpicks needles, so much nicer for increasing and lace work than the blunter Addi needle tips. 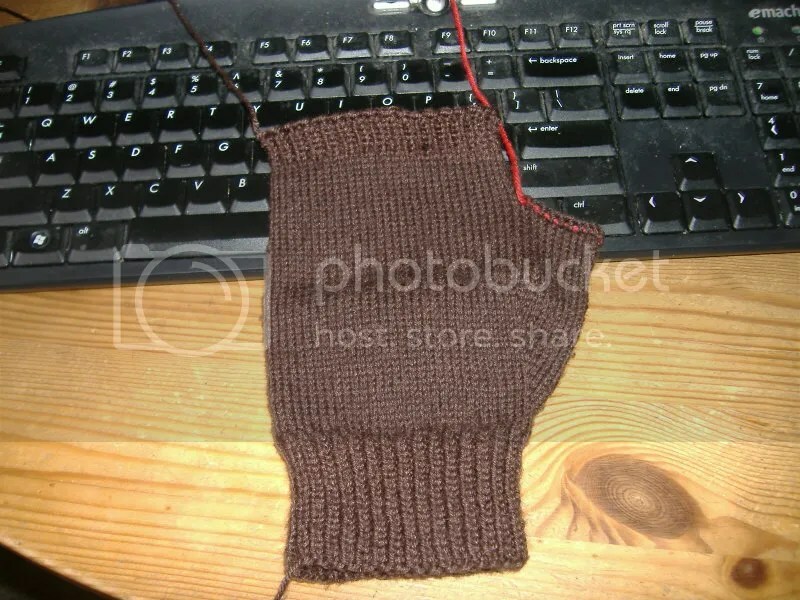 I dread doing the thumb gussets on the Joe Schmoe Fingerless Mitts because a M1L is doable, but a M1R is a massive PITA with a blunt tip needle and there are ten of those suckers. I have a 36″ size 1.5 Addi lace needle but it’s too grippy and I don’t like the way the brass smells when I’m using it. As long as I’m griping about Addis, I will also add that I hate their new cables. The nicest thing about Addi needles was the gold cable. Now they all seem to have monofilament cables and they just aren’t as supple as the old gold cables, another thing the Knitpicks needle has going for it. For sock yarn, I have two hanks of Colinette Jitterbug, a hank of Madeline Tosh and one of Malabrigo in my stash to be used. I’ll be using my Addi size 2.5’s for all but the Malabrigo, so I don’t have to worry about the Knitpicks needles for a bit. I want to replace my 40″ Addi sock needles with Knitpicks needles but I’ll have to wait and see how this second needle holds up before I make a decision. My mom loved her socks and the ones I made myself are lovely and soft. 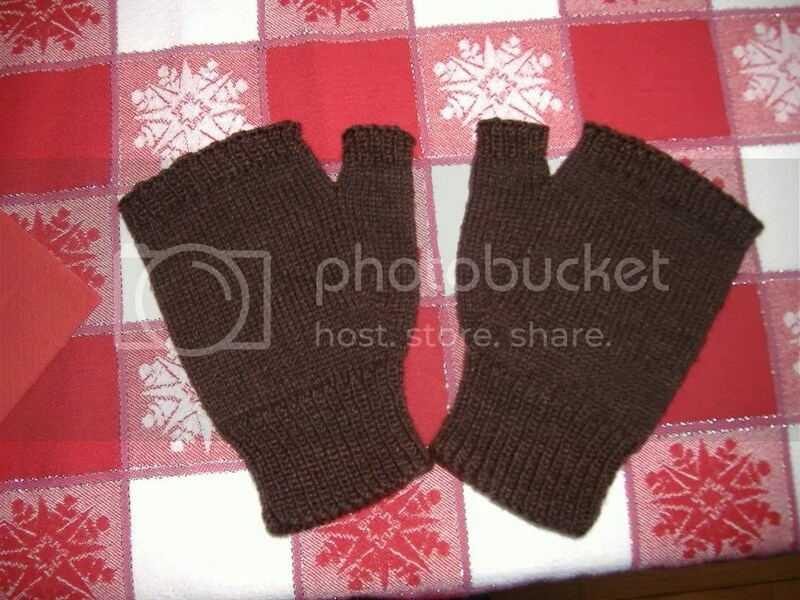 I managed to finish one fingerless mitt for my dad and will be giving him its mate over the weekend. 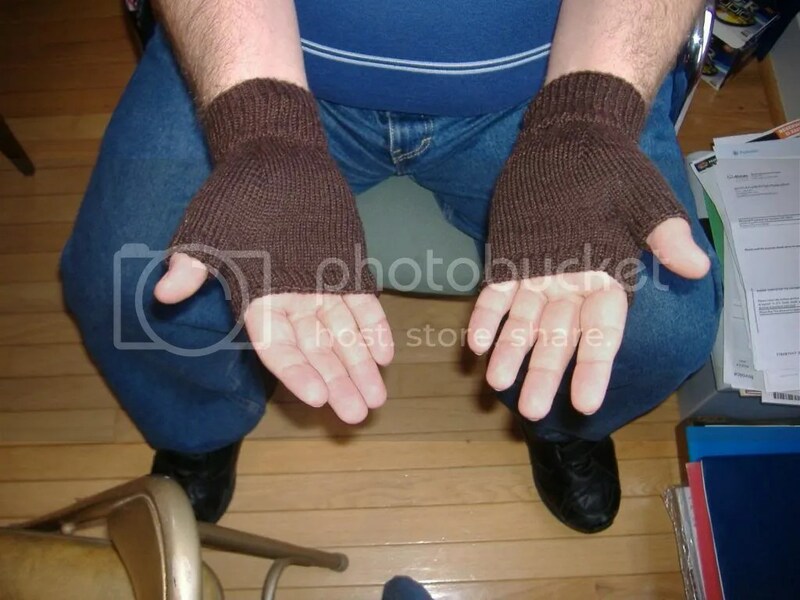 Once I get the ones I’m making for my husband done, I’ll be posting my Joe Schmoe Fingerless Mitt pattern here with a promise to make it a pdf after the new year once I get my new logo squared away. Merry Christmas and Happy Holidays to everyone and thanks for reading! I finished the first fingerless mitt last night (well, almost finished — I only have the thumb left) and it looks pretty good. The problem is that I think it’s going to be too big for my dad. 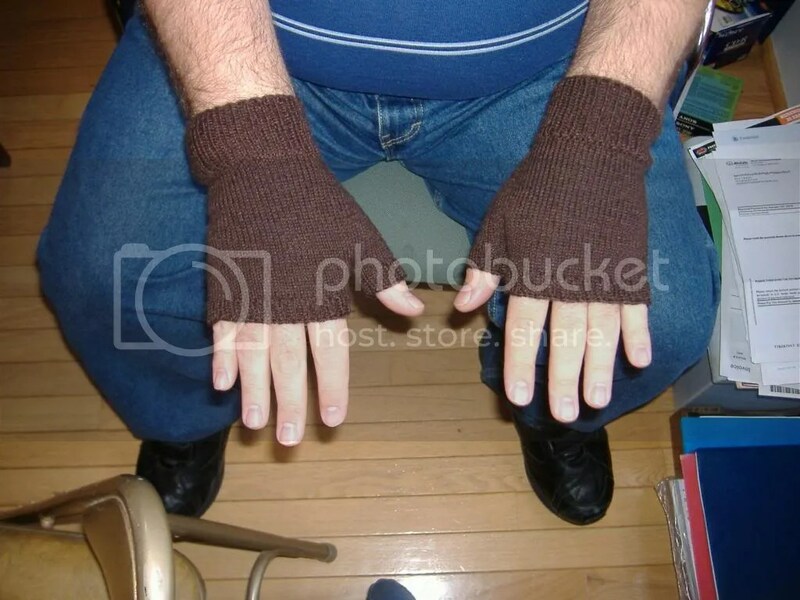 I had my husband try it on and it fits him perfectly, but he has HUGE hands, like regular men’s gloves don’t fit his hands. So I’m getting ready to cast on with about a half-inch’s worth of fewer stitches and a few less rounds here and there and hope that this time I get it right. I’m doing it in Knitpicks Stroll in Fedora on my size 2.5 addis. The pattern will be up after Christmas. Due to a couple of snafu’s with getting my order processed, the yarn for the socks I was going to make my dad didn’t get to me until this past Wednesday. I started the first sock and got three inches into the leg before admitting to myself that it just wasn’t going to happen. I’ve since changed my mind and started on fingerless mitts for him. He does a lot of work on his 33 Plymouth and this way he can have warm hands while leaving his fingers free for delicate work. I’m just about ready to separate the thumb stitches and finish the hand which should be done by tonight. I’m still not sure if I’m going to be able to finish them in time for Christmas at this point because I just can’t spend every waking moment knitting, so he may be getting one mitt and an IOU for the second. Once I’m done with them, I’ll post the pattern here and then eventually get around to making it pretty and putting it in my Ravelry store. I started winding the yarn for this pair of socks back in March of 2011 and last night I kitchnered the toe on the second one and wove in all my ends and they are now on my feet. They are made with Three Irish Girls yarn on size 2.5 needles. Nothing fancy, just plain stockinette socks using my own pattern to fit my freakish feet. This pair I also finished last night and are to be gifted to my mom for Christmas. 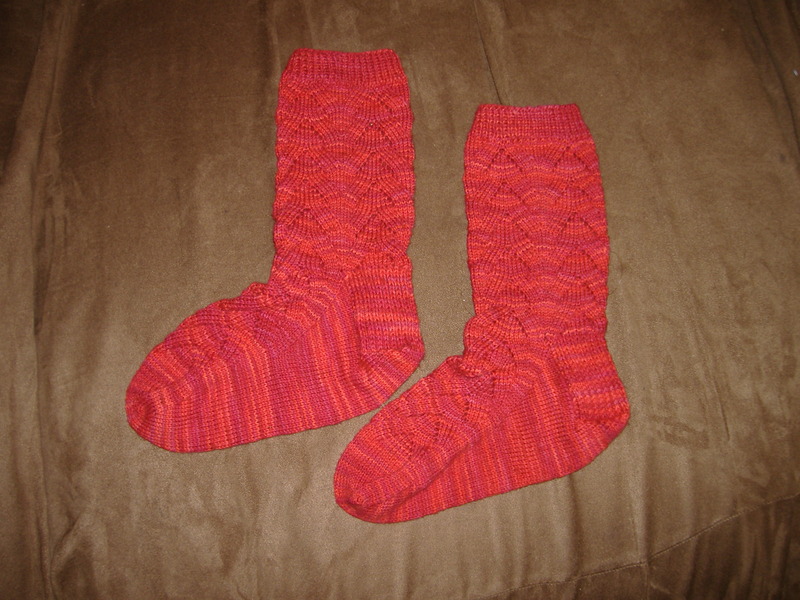 They are the No Purl Monkey socks done up in Knitpicks Stroll Tonal using a size 1.5 needle. I actually cracked the needle knitting these and unlike addis, the kintpicks needles don’t bend. I’m going to be calling customer service to see if I can get a replacement, but I don’t have high hopes of it holding up any better than the first one. Right now, I’m swatching for a pair of plain stockinette socks for my dad, who even with his size 10 feet the socks will be smaller than the ones I make myself. I have a ton of appointments this week so I’m going to have to really buckle down if I have any hope of finishing these by Christmas.